The Air Kit 2 is a Dero-designed and fabricated bike pump made for public use and built to withstand weather year-round. 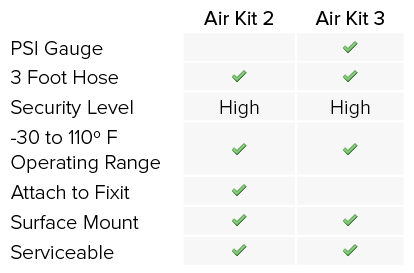 Made in Minnesota (where we know a thing or two about weather), the Air Kit 2 is built from tough, Schedule 40 steel, and is serviceable down to the plunger and gaskets. It also features our new Metal Head™, a sturdy cast aluminum pump head with Presta and Schrader valve compatibility. The pump has a steel-reinforced air hose for added durability, and replacement pump heads and gaskets are available on our website. 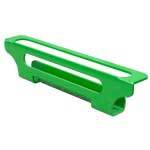 Supplement your Air Kit with our Pump Stop, a convenient accessory that holds bikes upright while filling your tires. Air Kits require occasional maintenance and replacing of parts to remain serviceable. Maximum quantity for online order is 9.